This recipe quite surprised me when I first tried it about 6 years ago. Hot fudge + pudding + cake = tasty fun in my book!! So, I tried it out. It looked a little funny after I followed the directions and assembled it all in the pan. This is what it looks like right before you put it in the oven. Looks like a watery mess, doesn't it? Aaaahhhhhh... chocolate bliss!!!! Fudgy brownie like cake on top and rich chocolate pudding below!!! The recipe says to serve it with ice cream, but we've never done that. We just eat it as is. Hot and yummy!!! Here's the recipe in case you want to try it. It comes together FAST and can bake while you and your family sit down to dinner. Serve it hot (I don't like the taste nearly as much when it cools) and prepare for happy, smiling faces around your table!! Mix first 5 ingredients in a bowl. Stir in milk and shortening. Spread in an 8x8 inch prepared baking dish. 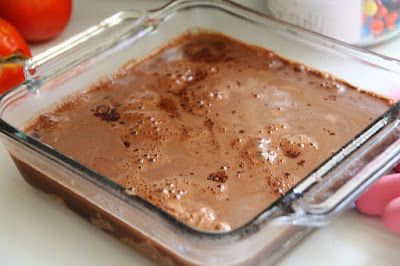 Mix brown sugar and additional cocoa and sprinkle over mixture. Pour 2 cups hot water on top and bake at 350 degrees for 40 minutes. Serve hot alone or with ice cream. YUMM! I think this is one to try! Even the DH who doesn't like cake will enjoy this one. That looks absolutely delicious!!! Thanks for sharing the recipe for it. One of my childhood favorites!! I still make it for my family. Yum! So there isn't a box of pudding mix in there? The water on top creates it? Yes, ma'am, Betsy, Somehow it all mixed together and makes this delicious chocolate pudding!! It's thinner at first because it's so hot, but after a minute or two, it thickens up and is SOOO tasty!! That looks SOOOOOOOOOOOOOO heavenly! I could eat that whole pan! Hahaha! Those tags are with the Martha Stewart stuff. There are several different design cutouts in each bag. I use them all the time! They're perfect! 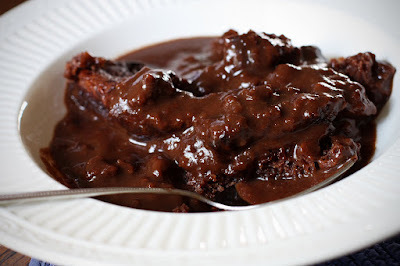 Ok then...I'm making this for The Mister, who loves chocolate...the darker and richer, the better! Yum! That looks divine! I saw your comment over on Betsy's post with the daisy beside it, and I just had to come over to your blog. I am so glad I did! Oh dear! Betsy, I am so sorry!! yes, 350 degrees (and thank you for pointing out that I left out that critical bit of information!!!). And it is definitely 40 minutes in my oven. The edges of the cake part looked done, the pudding part bubbles up around the edges and the middle "moves" a little when touched because there is pudding in there. Yum! I hope I'm not too late getting this information to you! It's pretty good, but not very sweet. I think I would like it better with more sugar.